Chrysler Group LLC has unveiled the most luxurious formerly-known-as-Dodge Ram truck ever produced by the company. Named the Ram Laramie Longhorn edition, the Ram lineup’s most well-appointed model is designed for the owner who needs a truck for work or play, but won’t settle for anything but the finest quality and refinement. Ram Laramie Longhorn edition models are prominently commemorated with distinctive Western-style exterior badges. A chrome metal Laramie Longhorn edition badge with painted accents is mounted to the tailgate while eye-catching model-specific (1500, 2500 or 3500) Laramie Longhorn edition badges adorn the doors. Laramie Longhorn edition is available in five color choices, including an exclusive Sagebrush with White Gold exterior paint treatment unavailable on other Ram models. Matching White Gold lower-body two-tone, wheel flares, painted front and rear bumpers and Mopar running boards complement a bright chrome grille and painted tow hooks. Other colors include Bright White, Brilliant Black Crystal Pearl, Rugged Brown Pearl or Deep Cherry Red Crystal Pearl. 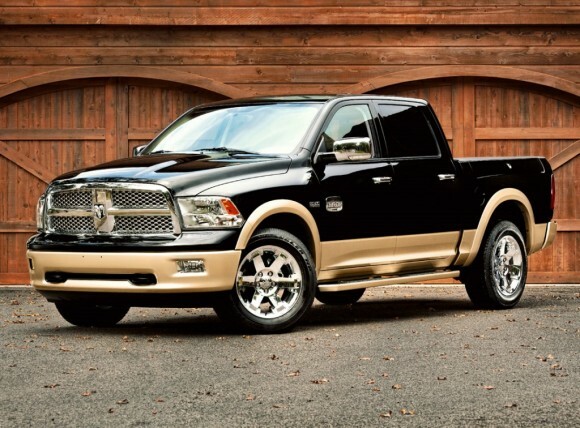 All Laramie Longhorn edition trucks are matched with the special White Gold accent color. The Ram 1500 Laramie Longhorn edition is equipped with 20-inch chrome-clad aluminum wheels, while 2500 and 3500 single-rear-wheel models roll on polished aluminum wheels. Ram 3500 duallies get polished aluminum wheels with Laramie Longhorn edition-badged center caps. Ram Laramie Longhorn edition is also distinguished by its unsurpassed interior refinement. Building on the award-winning interiors of the Ram 1500 and Ram 2500 / 3500 Heavy Duty pickup trucks, Laramie Longhorn shatters truck stereotypes. A full leather interior, engraved details and burled walnut woodgrain surfaces lend the Ram Laramie Longhorn edition an unmatched level of sophistication and style. Laramie Longhorn is available with a choice of dark slate gray and russet or bark brown and light pebble beige interior colors. The interiors feature 100 percent leather seat coverings with laser-etched bolsters (bark brown only). The leather-wrapped steering wheel receives special stitching while door trim front and rear is also wrapped in leather and features special stitching, wood grain and LED door-handle and map-pocket lighting. dark slate gray with premium russet-hued seat leather. The second is southwestern-influenced light pebble beige with bark brown seat leather. The bark brown interior incorporates laser-etched filigrees, with a hand-worked appearance. Seat fronts for both themes include a stitched-on leather Laramie Longhorn badge, either branded (russet) or laser-etched (bark brown). Contrasting leather welts, also called piping, provide seat-edge emphasis. Additional accents are created along either side the welts by tan or dark slate-colored deck-seam stitching. Ram Laramie Longhorn edition features unique leather front seatbacks distinguished by flap-closure pockets whose details authentically evoke saddlebags. Each pocket is secured with silver steer-logoed, tooled-metal buckle with a magnetic clasp. Ram Laramie Longhorn edition owners will be greeted by the highest-quality materials every time they climb behind the wheel. Laramie Longhorn’s exclusive instrument cluster takes on the appearance of hand-wrought jewelry with six liquid chrome gauge rings set against a painted taupe silver background and a tooled-metal Laramie Longhorn edition badge set inside the left-hand ring. The two main gauge rings feature a hand-crafted look with a coined inner edge and filigrees engraved on the top surface. Set inside those rings, the lower edges of the gauge cluster dials are detailed with small filigrees that are softly backlit at night. The Ram Laramie Longhorn edition’s dash features a center stack trimmed in burled walnut wood graining. The wood grain is stained in one of two complementary shades, matched to either the russet or bark brown interior theme. Chrysler designers borrowed from high-end furniture-grade and gun stock designs in their choice of wood grain. Painted taupe silver side bezels, resembling polished pewter, are special to the Laramie Longhorn, while chrome vent rings complete the center stack’s details. On the passenger side, the upper glove box door – there are two – becomes a focal point with the addition of a full-length, filigree-engraved aluminum band and Laramie Longhorn edition badge. Beneath the instrument panel is soft, new footwell lighting, providing both a functional and aesthetic interior enhancement. The Ram Laramie Longhorn’s cavernous double-stacked center console is topped with a soft, double French-stitched full-leather lid featuring either a branded (russet) or laser-etched (bark brown) Laramie Longhorn logo. The pewter-colored highlights from the center stack flow rearward, continuing along the outer edges of the center console. A chrome ring outlines the console’s center bin and cupholders. Ram Laramie Longhorn’s steering wheel and shifters – console mounted on 1500, column mounted on 2500 and 3500 Heavy Duty models – feature premium leather. Matching X-stitch detailing sets off both the steering wheel and shifter. The leather console shifter on 1500 models is entirely new, accentuated by taupe silver side panels and a bright chrome base. The leather column shifter on Heavy Duty models is completed by a chrome end cap. Armrest uppers are wrapped in premium leather and accented with the same dual French stitch used on the center console lid and instrument panel. Burled walnut-grained panels trimmed by chrome tracers add to all four doors’ visual appeal. Ram Laramie Longhorn editions receive remote lighting at the inside door handles and a full-length light that illuminates the truck’s multi-function lower map pockets, front and rear. Laramie Longhorn’s luxurious carpet is protected by specially designed all-weather rubber mats with polished metal Ram Laramie Longhorn edition Badge and removable carpet inserts. The mats themselves incorporate the filigree designs from the dash and seats, while the snap-in inserts are a high-end, color-flecked Berber-style weave that luxuriously blends the two interior colors. Along the doorsills new brushed-silver Ram-branded sill plates resist scuffs and add visual appeal. Laramie Longhorn comes equipped with all of the standard equipment found on the top-level Ram Laramie and adds a navigational radio, remote start, back-up camera, front ventilated seats and rear heated seats. Power adjustable pedals with memory and front heated seats with 10-way driver’s adjustment – standard on Ram 1500 Laramie models – are also added to Ram Heavy Duty Laramie Longhorn editions. Ram Laramie Longhorn will be available in 1500 (half-ton), 2500 HD (3/4 ton) and 3500 HD single and dual rear wheel (1 ton), Crew Cab and Mega Cab; four-wheel drive and two-wheel drive; and short- and long-wheelbase models. Laramie Longhorn will join the other Ram trim levels, which include: ST, SLT, Outdoorsman, Sport (1500 only) Laramie and Power Wagon (2500 only). Ram Laramie Longhorn models will go on sale first quarter 2011. Prices will be announced closer to launch.